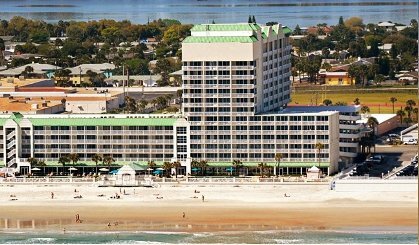 Our Sun Sea and Sand Ocean Front Beach Resort Vacation Condo is one of 5 we offer in the Daytona Beach area. 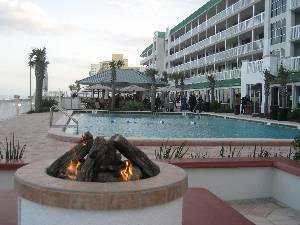 Center located at 2700 N. Atlantic Ave. DBR is a beautiful resort.A place where memories are made. This condo is our home away from home, so it offers much more than the average unit in this resort rented by the hotel, at half the price. 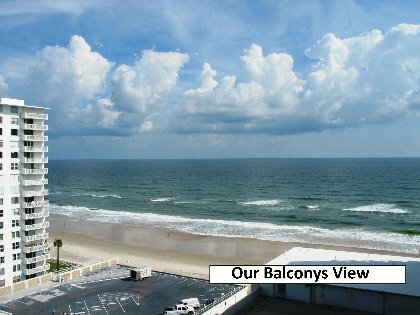 Our unit has beautiful views of the Atlantic ocean and the beach, also you are able to view wonderful sunsets over the inter-coastal waterway. Great beachfront location with a large shopping center just across the street. DBR is on the beach with an indoor pool and 2 hot tubs. Outside 2 large pools one of which is heated year round also a workout room and sauna. The resort has oceanfront dining, a pool tiki bar and even a fire pit for spectacular evening stargazing. Please note Rates vary through out the year, $550 is our average weekly rate discounts provided with longer stays. Call or email for the applicable rate for your requested reservation. The fire pit on the pool deck is great for cozy evening star gazing. Comfortable couch is also a sofa sleeper. Deposit: Deposit is taken at booking with the balance due 45 days prior to arrival. Cancellations and Refunds: Refund if outside of 60 days or credit for future vist.